Hello my name is Helena otherwise known as The Queen of Collage. I'm a mum in her early 30's to two two gorgeous girls under three. My first was born in February 2015 and my second arrived in June 2016. I chose the name The Queen of Collage as I came to be playfully known under this creative name while attending art classes and it stuck with me when it came to creating this blog. Originally my blog was set up as a creative outlet in order to showcase my creations. Since then it has evolved to include my family's life and loves here in Oxfordshire and beyond. We are huge fans of geocaching and enjoy getting outside in the beautiful British countryside as much as we can. We love to read children's books together and of course do arts and crafts. 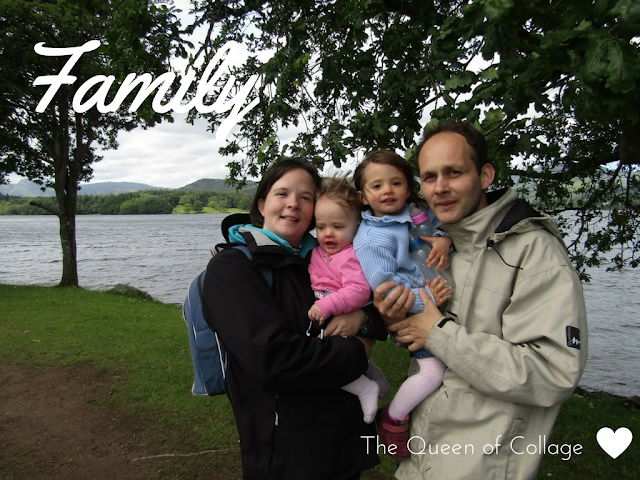 As my family are spread out across the world this blog is primarily a way for them to keep up to date with life's goings on in my household and beyond the walls. Of course the more the merrier and I'm very happy to hear from other people surfing the internet too. So if you've a love of travel, are enthusiastic about letting kids be kids or have a passion for up-cycled furniture and want to rid the world of brown furniture then put the kettle on, pull up a chair and enjoy my ramblings. From an early age a love of arts and creativity was instilled in me from drawing faces to creating clay hair with a tea strainer for clay animals. I acquired a GCSE in Textiles and pursued an arts degree in Media and English at the University of Gloucestershire resulting in a 2:1. In the past I have written for various publications both on and off the internet. From writing for the BBC's version of Hitchhiker's Guide to the Galaxy to journaling events for local newspapers. I am also trained as a TEFL teacher and possess a Mental Health First Aid qualification. If you like what you see please do consider getting in touch with me on Facebook, Twitter, Pinterest, Google+ and Instagram. I am happy to work with brands and can be found on Bloglovin.